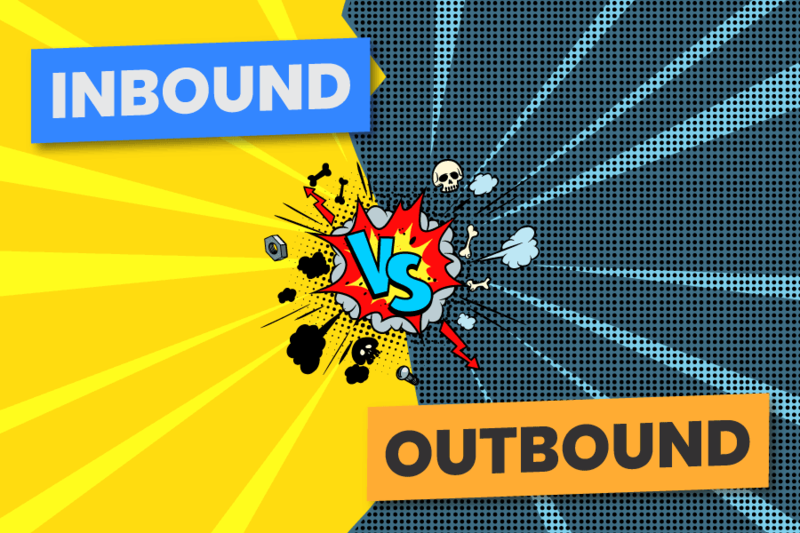 In this article, we’ll weigh up inbound vs outbound marketing, the pros and cons of each. (And we’ll even go as far as to proclaim a winner!) But first, let’s start off by defining each term. Inbound marketing is defined as “creating valuable experiences that have a positive impact on people and your business”. In other words, inbound marketing focuses on building a relationship with your potential customers. The goal is that when the time comes to make a purchase, customers already trust and believe in your organisation. As you’ve probably guessed by now, an outbound marketing campaign refers to the opposite side of the lead-generation coin -- i.e. the conversations that your company initiates. Many so-called traditional kinds of marketing are great examples of outbound marketing: TV commercials, satellite radio ads, trade shows, print advertisements and cold calls, for instance. But there are also lots of “new” online forms of outbound marketing as well. Cold email marketing campaigns and Google Adwords are both examples of this. So Which Marketing Tactics Work Best? Before we name a winner, let’s be clear: both the inbound methodology and outbound methodology can be an effective call to action, when executed properly. In fact, some of the most effective sales funnels start off with leads generated through both inbound and outbound marketing techniques. Inbound marketing includes tactics like content marketing and publishing case studies, to outbound tactics such as ad banners or even just picking up the yellow pages and calling. Since every business is unique, the exact combination of marketing techniques that will work for you is something that only experimentation will uncover. With all that said, here at Refuel Creative, we have been inbound marketers before that was a term. We believe that inbound marketing is the most effective way to get your goods and services in front of potential customers for a number of reasons. Here are a few reasons why inbound marketing efforts are the future of lead generation. Your tap is leaking. You need a plumber. How do you find one? You picked up your phone, went to a search engine and typed in ‘emergency plumber’ or something similar, didn’t you? The way we seek products and services changed because of two things - the internet and the smartphone. Before these two things, sales and marketing used to have all the power. You’d open up your Yellow Pages, and look for a plumber, and choose from one of the plumbers that advertised in there. You’d open up your newspaper, or local paper, and find your local tradie in the advertisements. Again, you’d only see those that advertise in the paper. Now, we have a global marketplace of suppliers at our disposal in the palm of our hand. So as marketers, we want to focus on inbound marketing techniques, such as search engine optimisation and content writing to ensure your business is at the top. We also want to share quality content that our customers want to share on social media, so that when someone posts to Facebook looking for a suggestion for a tradie, our content is provided and our name enters the selection. In the internet age, we have become increasingly inundated with advertising and other forms of outbound marketing. This has had a profound effect on the collective consciousness - as CMO reports, over seventy percent of Australians now say that “advertising can’t be trusted”. (This is precisely why ad blockers are so popular!). Inbound marketing helps solve this problem by abandoning pushy and abrasive advertisements for genuinely helpful forms of marketing such as content creation and search engine optimisation. Many successful organisations and well-known business thought-leaders have written about the fact that a repeat customer is worth far more than a new customer, which is pretty self-evident. (Though you can read more about it in this recent Constant Contact article, if you’re interested). It should also be pretty apparent why inbound marketing is best tailored toward the purpose of creating repeat, long-term customers. As we discussed at the beginning of this article, it’s all about building relationships! Inbound marketing refers to three stages here - convert, close and delight. We convert the visitor into a lead, close the lead as a customer, then delight that customer to turn them into a promoter. Millions of pieces of content are shared on social media every day, from silly memes to valuable bits of insight on Linkedin and everything in between. Overall, organic, value-based content is always more likely to be shared than ads - even if the “value” provided is nothing more than a laugh. This is precisely why inbound marketing and social media marketing go together hand in hand. Last, but certainly not least, inbound marketing is more valuable because the content created for inbound marketing can outlast your initial campaign. This is especially true as thought-leaders continue developing new methods for recycling content. Ads, on the other hand, tend to lose their value as soon as the ad spend dries up! Your content also becomes an indicator to search engines on your authority in your chosen area of expertise, helping you build your search engine rankings over time. Although both inbound and outbound marketing have their strong points, inbound is undeniably the better fit for most modern customers, regardless of whether you work in a B2B or B2C industry. To learn more about inbound marketing (and how working with Refuel Creative and/or HubSpot can help drive your inbound marketing strategy) get in touch with us today!